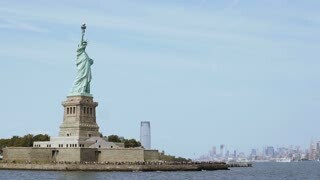 Wide panoramic shot of world famous Statue of Liberty national monument and New York City skyline, view from the water. 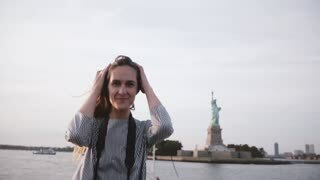 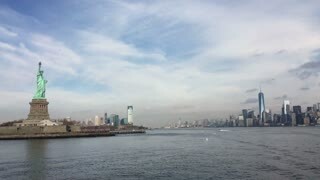 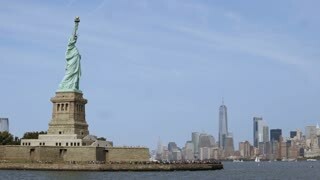 Portrait of happy tourist woman with flying hair enjoying New York skyline at Statue of Liberty from a boat slow motion. 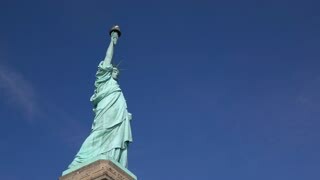 Happy traveler woman with hair blowing in the wind enjoying New York skyline at Statue of Liberty on a boat slow motion. 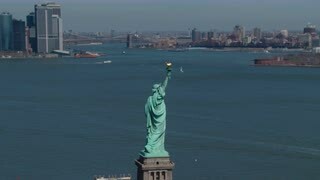 Panning view of Statue of Liberty monument with amazing New York City skyline in background on a clear sunny summer day.